Published by Exisle Publishing Pty Ltd, 2017, 303 pages. Dates matter, and they are often a starting point for our engagement with history. For most New Zealanders, days like 6 February or 25 April are laden with significance. They are recognised as markers of important moments in our past; they inspire pride, connection, reflection, or perhaps controversy. Some dates hold a sombre or sinister place in the nation’s collective memory: 22 February (the second Canterbury earthquake), 12 October (Passchendaele) or 24 December (Tangiwai). Others highlight more uplifting moments, like Rutherford’s Nobel Prize (10 December 1908), Hillary’s ascent of Everest (29 May 1953) or New Zealand’s golden hour at the Rome Olympics (2 September 1960). This book presents a series of snapshots of New Zealand historical events organised by date, from 1 January to 31 December. They range from dramatic headline moments to the hopefully less familiar and sometimes downright quirky — from Jockey Y-fronts (16 March 1940) and a Nazi sabotage hoax (29 March 1942) to the Greymouth beer boycott (29 September 1947) and a parachuting Santa (20 November 1937). 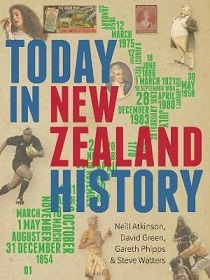 A timeline lists some of the key moments and events that have helped shape the course of New Zealand’s political and constitutional development, while Born on this Day boxes scattered throughout the text provide brief biographical details on almost 100 figures of significance to New Zealand history.